If you’ve ever wanted to learn how to play an instrument, you’ve likely discovered one big obstacle: it’s incredibly expensive! Learning how to play an instrument of any kind requires both a ton of time and expensive lessons – as Angie’s List¹ writes, learning the piano can cost as much as $60 an hour, and supplies like music books can cost another $60. Skip the pricey private lessons and try an online music program. These new online programs and courses offer a cost effective way to learn the basics of any instrument as well as advanced music concepts. No matter your musical goals, the following websites and online programs give you the chance to master music on your own schedule at a reasonable price. One of the best ways to learn music is to immerse yourself in it – and Berklee College of Music Online lets newcomers and experienced musicians alike join an online community dedicated to learning. A branch of the renowned Berklee College of Music in Boston, this online program offers over 150 courses. Every one of this online college’s programs are designed to help you fulfill your goals quickly and affordably. Once enrolled, you’ll have full access to lesson plans online so you can complete assignments any time that suits your schedule. Even more enticing is Berklee’s selection of free classes. Students who want to test the waters before enrolling can take some introductory classes without paying a cent. Learning music or a musical instrument is made substantially easier by Udemy, an online platform that connects individuals with experienced instructors. As a global marketplace, Udemy is home to more than 80,000 different courses so aspiring artists can master new skills. No matter what you’d like to learn, from composition to songwriting to piano or guitar, you can find it at Udemy. One of the best benefits is the affordability Udemy’s available courses. Many of the courses are college-level options, but they cost less than $20. Once you pay for a course, you own it, which means you can access it whenever you want for years to come. Whether you’re a beginner or an expert, you’ll have no trouble with finding instructors who can improve your abilities. Udemy has a wide range of music-based topics to explore, and the teachers constantly post easy-to-understand videos, lessons, and lectures. If you want to learn music without leaving home, without spending hours in classes, or without a single cent spent, head to YouTube. You already know that YouTube is home to millions of user-created videos on every subject imaginable, but you may not realize just how helpful it is for new musicians. All you need to do to get started is search for music lessons in what you’d like to learn, and you’ll discover hundreds of videos on those topics or instruments. Each content creator uploads their instructional videos for free, and you don’t have to pay anything to glean their personal tips and knowledge. YouTube also allows instructors to post lessons and host live sessions – and, like all YouTube content, each video can be accessed as often as needed. Because YouTube is an enormous community, you’ll also have a benefit that doesn’t come with private lessons or a traditional classroom: the privilege of connecting with like-minded individuals and music enthusiasts worldwide. You can share your favorite videos, create playlists, share your own progress by uploading your own videos, and subscribe to teachers you find most helpful. Another perk? All YouTube videos have adjustable playback speeds, which means you can slow them down to see and hear every note being played. Picking up an instrument and trying your hand at an entirely new skill is a life-enhancing decision. 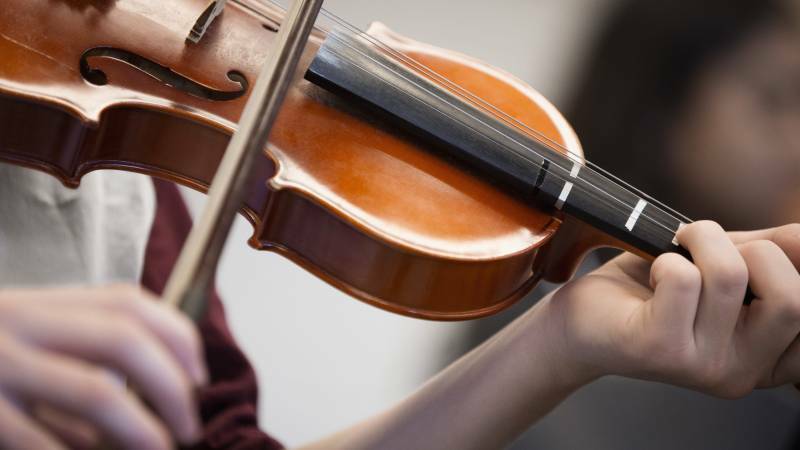 If you take the time to learn how to play a new musical instrument, you’ll reap benefits far beyond knowledge – you can, according to Inc.com³, stimulate your brain, improve your memory, hone your reading skills, and reduce your stress levels. No matter your reason for wanting to dive into a new musical hobby, you can have fun and gain new skills along the way. If you’re ready to start learning today, it’s time to find an online music school or educational program that suits your learning style, your busy schedule, and your budget. The above online options are only a place to start. Search online, and you’ll discover even more options that will help you learn an instrument on your own time at an affordable price. Interested in online music education? Start a search today.